Before I finished up for Christmas, I made my best efforts to use up everything perishable in my fridge so that I didn't have to needlessly throw it away. Among the items that I needed to use up were a large pot of cottage cheese and a carton of cream. What better to make with those items than a cheesecake. I did have to invest in some biscuits and cream cheese to make it, but the luxury of a cheesecake is surely worth it. The recipe I decided to use for my cheesecake was a handwritten one that I had scrawled down years ago from a cookbook owned by my flatmate. He happened to own the only cookbook that anyone possessed at that stage in our lives, so I made the most of it by copying down any recipes that took my fancy. Sadly, I have no idea what the cookbook was called. 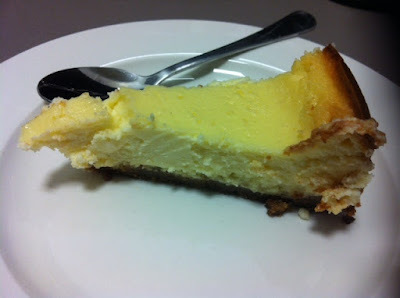 It has been years since I made this particular cheesecake, so it was a pleasure to dust off the old recipe, use up my kitchen leftovers, and reminisce about days long past. The cheesecake cracked on top, despite my leaving it in the oven to cool, but it still tasted smashing. I could have made a sour cream topping to cover it up, but it didn't matter so I didn't. Grease and line a 20cm springform pan. Mix the melted butter, cinnamon and biscuit crumbs together in a bowl and press into the base of the prepared springform pan. 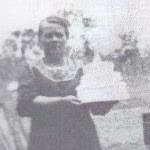 (I found the butter was a little too much - you may want to add it gradually and only use what you need to make a moist crumb.) Place the base into the refrigerator to cool while you make the filling. In the bowl of a stand mixer, beat together the chopped cream cheese and cottage cheese until smooth. Beat in the eggs, one at a time. Add the cornflour, lemon juice and lemon zest and beat until just combined. Switch to a rubber spatula and fold in the sour cream and cream. Pour the cheesecake filling into the chilled base, then place in the oven to cook for 45 minutes - 1 hour (it will be only slightly jiggly in the centre once done). 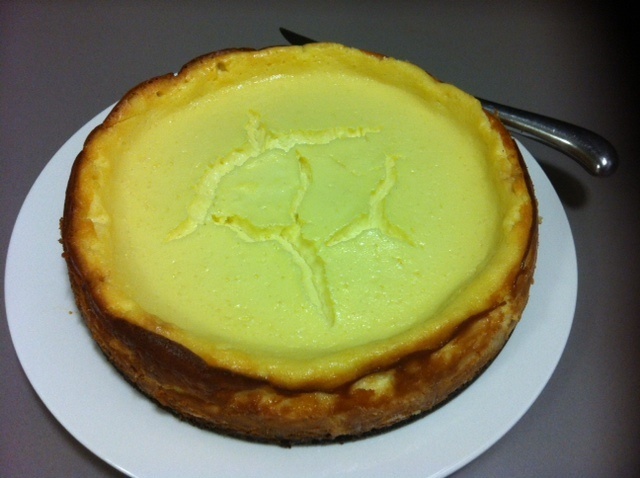 Leave the cheesecake in the oven with the door slightly ajar to cool completely, then refrigerate the cheesecake for at least 6 hours or overnight before serving by removing the outer ring of the springform pan and slicing the cheesecake into generous pieces. Serve with fresh cream and fruit, or as is. For dinner one evening, I made this Mongolian lamb recipe by Julie Goodwin, published in the November 2015 edition of The Australian Womens Weekly to promote Julie's new book, Homemade Takeaway. I liked this recipe because it was quick and tasty - it was like healthy Chinese takeout. I served my Mongolian lamb with stir fry vegetables for a complete meal, and really enjoyed it. I'd make this recipe again. I hope that you all had a wonderful Christmas - I know I did. Coming down from the dizzy heights of Christmas, I thought I'd take you back to just before the mad month of December began, when Tim and I went to Two Dudes Kitchen in South Yarra for lunch. The menu is not extensive but has a fair selection of typical cafe fare, with daily specials available. I thought the wrap was really tasty - I enjoyed the spicy pork wrapped in a soft tortilla with cooling lettuce. The service at Two Dudes Kitchen was prompt and friendly, even though we arrived quite late for lunch (around 2pm). If we happen to be in the area again, I would definitely go back to Two Dudes Kitchen. For Eating with Ellie this week, Kayte chose Coconut Date Truffles from p290 of Weeknight Wonders. These are like candy in a healthier form - dates, pistachios, cocoa and coconut made into little balls. These truffles were really good - they were delicious even though I slightly burned the pistachios by not paying them enough attention while pan roasting them. The last of this year's Christmas box treats is Caramelised Almonds. I followed Andrea's recipe (skipping the fleur de sel and almond oil), which is online here. These caramelised almonds were very simple to make, and everyone liked them. My only tips are to be prepared to use your muscles to stir the almonds while they are caramelising, and don't give up - they eventually do just what Andrea says they will do. My arms were getting quite tired from stirring these almonds, and after the sugar crystallised on them, I started to think it would never melt again to form the toffee coating on the nuts. However, I persisted, and in the end, I got gorgeous mahogany-hued toffee-ed nuts. Thanks to Andrea for the recipe. I served scoops of these nuts in clear cellophane bags - a really nice Christmas gift. For Tuesday with Dorie this week, I made Stained Glass Cookies, the second holiday recipe for this month that we could bake in any order. I chose to make these second as I wanted to include them in my Christmas boxes. I benefitted from the posts of other bakers who made these last time. I followed Mardi's advice and did not glaze these cookies with egg wash, leaving a white-ish cookie with "stained glass" inside. My "stained glass" was made by bashing up Coles lollipops with a hammer. I liked the lollipops because they come in little individual wrappers, which kept the crushed lollies inside until I was ready to release them. These cookies turned out well from my perspective. The only thing that was a drawback for me was that they were quite fragile, so I broke a few lifting them off the trays. I did like the taste though, and the "stained glass windows" made them super cute for Christmas. It is summer here in Australia, and cherries are in abundance. For my Christmas boxes, I decided to take advantage of the cheapness and abundance of cherries make cherry jam, using this recipe. Unfortunately for me, this jam did not want to set - I didn't have any jam setter, so after a while, I decided to call it a day and rebrand my cherry jam as cherry sauce. It didn't matter in the end - the cherry sauce, as it had now become, was absolutely delicious, especially as I had laced it with a little kirsch to give it a special something. I ate this sauce from one of the leftover jars spooned over vanilla icecream - although it was also very good straight out of the jar. All in all, there was a silver lining, and I have no complaints about the conversion of my jam into sauce. Another addition to this year's Christmas boxes was gingerbread men. Everyone seems to like gingerbread men, and I had bought a "Cursed Cookie" cutter the year before to make gingerbread men that were in the shape of voodoo dolls. 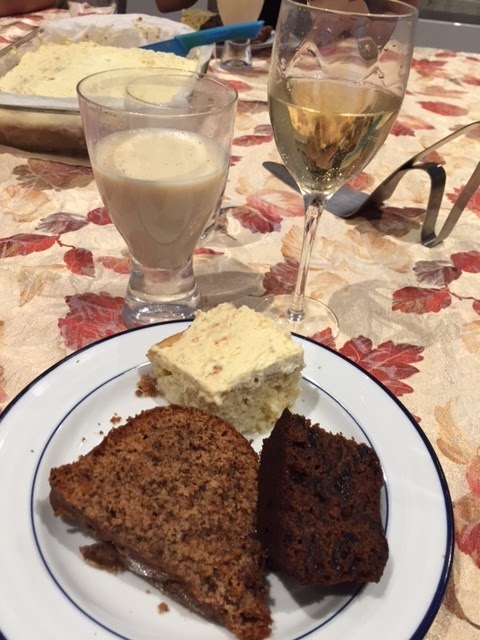 The gingerbread recipe that I used was from the Bourke Street Bakery Cookbook - I have previously posted the recipe here. This is a really nice tasting gingerbread. This time, I made 20 gingerbread men using a large cutter. I lost three f them because I accidentally lighted the wrong burner on the stovetop where they were cooling, and you can guess the rest. I was lucky not to lose the whole tray. To decorate my gingerbread men, I took a leaf from my Day of the Dead cookie decorating experience and topped the gingerbread with white fondant that I had stamped with the voodoo doll design from the cookie cutter. I highlighted the details using Queen writing icing pens. I think these gingerbread men looked pretty cool, and the gingerbread tasted good - I ate the head from one of the burned gingerbread men, as the head had escaped the heat of the gas burner. For my Christmas boxes this year, one of the items that I made was Karen Martini's White Christmas. The recipe is online here. Unlike the usual White Christmas, which is made with copha and powdered milk, this White Christmas is based on white chocolate. The additions are a little exotic too - Turkish delight, puffed amaranth and sour cherries. This White Christmas is very sweet, but if sweet and white chocolate are your thing, this may be for you. On Thursday, 10 December, The Melbourne Cake Club met at Dalya's house to celebrate A Traditional December. Dalya had set the scene by decorating her table beautifully, and serving us all a glass of bubbly to kick off. She also served each of us a glass of delicious eggnog (complete with a rum toddy) to keep us partying on. It was beautifully moist and light and sweet. You can't see it, but there is gorgeous silver glitter on top as well as the sugar snowflakes and silver cachous to give the cake a festive feel. 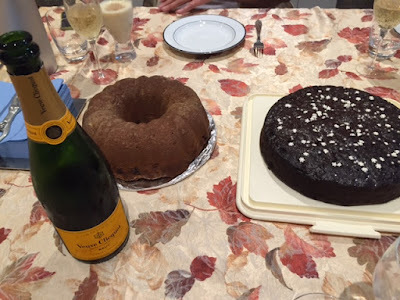 The verdict on my Gluhwein bundt cake was that everyone enjoyed the complexity of flavours and the marzipan. However, my personal view was that it was slightly drier than I would have liked - it was quite crumbly to cut, and I think it would have benefitted from a glaze or some frosting. 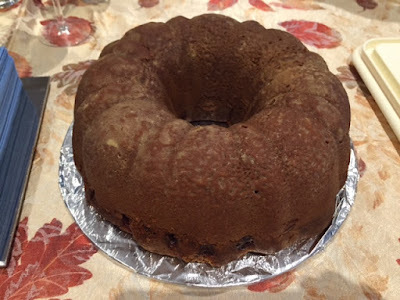 My Gluhwein bundt recipe was translated badly by Google Translate from a German website called Eating and Drinking - you can find the original recipe here. I made a few changes as, for example, Gluhwein fix and packets of vanilla sugar are nowhere to be found in Australia. Place all of the ingredients in a saucepan and heat until warm but not boiling. Remove the rind. Boil the Gluhwein and reduce to 150ml in volume. Add the cherries to the Gluhwein and allow them to soak for 20 minutes. Preheat your oven to 180 degrees Celsius. Grease and flour a bundt tin. Drain the cherries, collecting and keeping the Gluhwein that is drained off. Beat the butter, sugar, vanilla sugar and marzipan together in a stand mixer until creamy. Add the eggs, one at a time, beating well between each addition. Remove 1 tablespoon of flour and set aside. 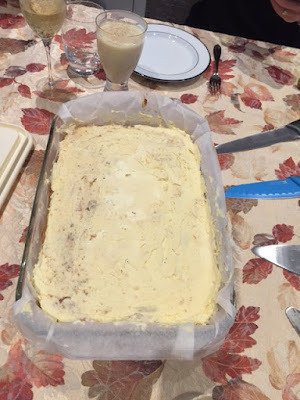 In a separate bowl, sieve and mix together the remaining flour, cornflour, cocoa, cinnamon and baking powder, then add the dry ingredients alternately with the reserved Gluhwein to the cake batter and mix well between each addition. Stir through the grated chocolate. Pour the batter into the prepared bundt tin. Toss the drained cherries with the reserved flour, then scatter evenly on top of the cake batter. Bake the cake at 180 degrees for one hour or until cooked through. 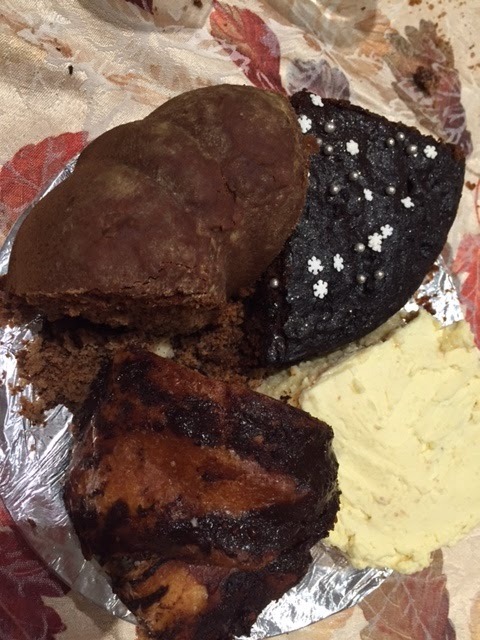 Remove the cake from the oven and allow it to cool in the tin for 10 minutes before unmoulding onto a wire rack. Brush the hot cake with 2 tablespoons of rum. Allow to cool completely. 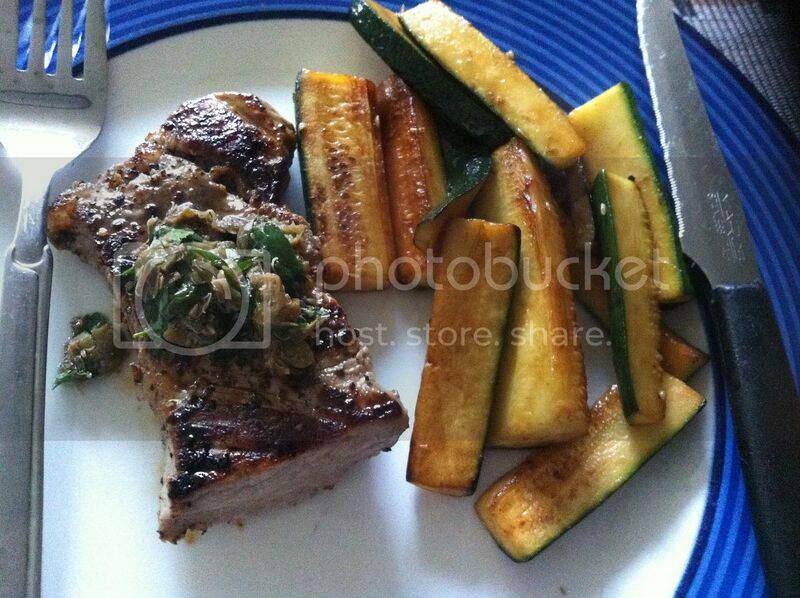 For Eating with Ellie this week, I chose Filet Mignon with Zucchini and Parsley Caper Sauce. You can see form the photo that I didn't use filet mignon - too pricey. Instead, I bought some lovely porterhouse steaks on sale and cut them into approximately the size of a filet mignon. I otherwise followed the recipe, including for the caper sauce and the sautéed zucchini, which were a pleasant surprise. I served this dish with last week's sweet and savoury carrot orange and date salad. It was a lovely dish all round, and one that I would make again. I especially liked the caper sauce. This week for Eating with Ellie, Peggy chose Sweet and Savoury Carrot Salad with Oranges and Dates. This was a simple but delicious salad made from the ingredients in its name and dressed with a tangy dressing. This salad was delicious - I served it as a side with next week's filet mignon recipe. Our Eating with Ellie group is having a holiday baking day today. My contribution is Cherry Chocolate Beer Cake. 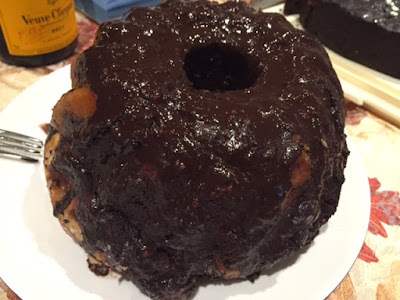 The recipe was in a newsletter I received from Castle Glen Winery; however, when I tried to find a fix to the mistake in the glaze recipe, I found that the origin of the recipe is actually here. The same mistake is also in the glaze recipe on that website. To fix it, you also need to add a tablespoon of cornstarch (cornflour) to the glaze when you are heating it to thicken it up. Castle Glen proposed this cake as an alternative Christmas cake, so I decided it would be a good addition to our holiday baking round up. It looks and tastes very festive. The stout gives a very distinctive flavour to the cake, and it is easy to make - the hardest part was pitting all of the cherries. 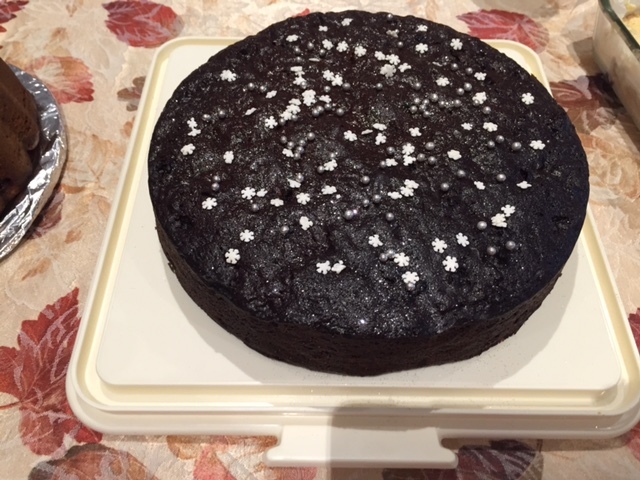 I only made a half recipe as I only have one 25cm cake tin. When I was out and about this last week, I found another festive item - Frosty the Snowman, all lit up in someone's front yard. It is very cute! For Tuesday with Dorie this week, we had the option of either making Stained Glass Cookies or Chocolate Chestnut Tart. I went with the Chestnut Tart because I want to save the cookies for inclusion in my Christmas gift boxes. We made the candied chestnuts ourselves in a vanilla poaching syrup. the syrup was reserved for later to eat drizzled over the finished tart. That syrup is magnificent all on its own - it is a shame that chestnuts are so terribly expensive, or I would make this more often. The tart is rich, smooth and of course chocolatey, and the candied chestnuts add a welcome texture and taste. To see what the other bakers thought of this tart (or the cookies, whichever they chose to make), visit the LYL section of the TWD website. Finally, I note that chivalry is not dead and I thank the unknown young man who gave up his seat for me on the train this morning as I commuted to work with my handbag, a tote and this tart in hand. It was much appreciated. A couple of weekends ago, I attended Paris to Provence, the Melbourne French Festival, with two friends. Paris to Provence is held in the lovely grounds of historical Como House in South Yarra. There are lots and lots of French food stalls, French homewares and French-inspired entertainment. saucisson, garlic bread, pear liqueur, jams, cheeses and a terrine. One of the best parts of the day was sitting back on the deck chairs dotted around the grounds with a strawberry dacquiri and watching the world go by - now that was heavenly. All in all, I had a terrific day at Paris to Provence.